This Christmas Eve, I would like to send out a heartfelt "Thank You" to all readers of the Mathisen Corollary blog around the world. The winter solstice-Christmas season is a fitting time of the year for spending some time in reflection and gratitude, and as I do so I was prompted to write a post expressing my gratitude to all of you who have taken the time to visit and to share feedback through the years. The Christmas story expresses the universal truth that the cosmic pattern, the Word or Logos, has been incarnated in the flesh of every man, woman and child: every one contains an immaterial spirit united with physical matter. As Alvin Boyd Kuhn explains in Lost Light: An Interpretation of Ancient Scripture, "It was a reference in ancient theogony to the descent of the Logos (the cosmic counterpart of the Christos in man) from the spiritual side of God's nature alone, as distinct from its progenation from the union of spirit with matter. [ . . . ] We are assured again and again that we are all sons of God and sons of the Highest" (47). He goes on to argue, as he does in all of his writings, that this same pattern is expressed by the "antecedent careers of such world saviors as Dionysus, Osiris, Sabazius, Tammuz, Adonis, Atys, Orpheus, Mithras, Zoroaster, Krishna, Bala-Rama, Vyasa, Buddha, Hercules, Sargon, Serapis, Horus, Marduk, Izdubar, Witoba . . ." (48). Reflecting on this concept, one could hardly do better than to go out into the dark night this week, when the stars of the heavenly pattern are absolutely breathtaking. Orion rises in the east in all his glory, followed by his consort the star Sirius, associated by the Egyptians with the goddess Isis the mother of Horus. In the photograph above, from an image taken by the Hubble Telescope, the stars of Orion can be seen in the right side of the frame, while the bright star Sirius is the enormous orb seen at the lower edge of the frame. 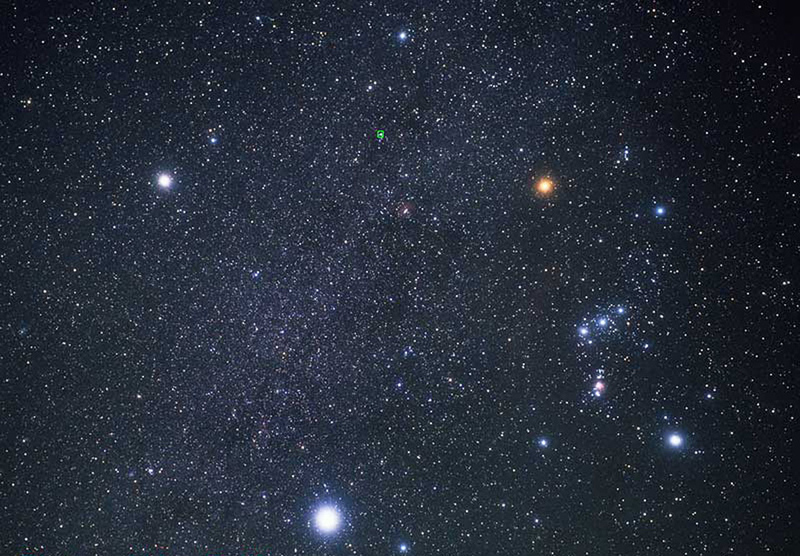 The bright star to the left at roughly the same level as orange Betelgeuse in Orion's shoulder is Procyon, the brighter of the two stars in Canis Minor, the Little Dog. The band of the Milky Way also runs right between Orion and Canis Minor, and Orion's upraised arm (on the Betelgeuse side) extends right into it. Nearby in the night sky, although not in the photograph above, you will also be able to see Taurus the Bull, the Pleiades pointing the way to Aries the Ram, Auriga the Charioteer near to the horns of the Bull, and the Twins of Gemini with the beautiful planet Jupiter nearby. The Moon is rising later and later each evening (truly a spectacular sight in its own right), giving several hours of good stargazing after sunset, especially for viewers in the wintery northern hemisphere right now (moonrise is around midnight currently). The ancients saw each individual man, woman and child as a microcosm of the macrocosmic pattern seen each night in the infinite heavens of outer space. Several previous posts have examined this ancient truth, including this one which discusses the way this pattern takes on human form through the helix pattern of DNA. This means that every person you encounter today is, according to the ancient wisdom recorded in the scriptures and sacred traditions of the world, an incarnation of the cosmic pattern, a unique individuated bearer in physical form of the Logos. And this means, of course, that every reader of this is as well, which fills me with profound respect and gratitude for each one of you!